$53 Promotional Gift Card available on this product! The fitment issue for Helite apparel products is a little different than most other motorcycle apparel. If you take a look at the Helite vest product, you’ll see that the key issue for fitment is matching your height to the recommended height range of the vest. With Helite’s apparel products where the air bag is built in, it is still important to get the right height air bag. So the first step in choosing a jacket size is to look at the size chart and see which size are recommended for your height, and secondly, see which size is OK for your max chest and belly. If you find a size that works for your height, chest and belly, you’re all set with a size choice! Those who are relatively short/stout or tall/skinny may not be able to find a size that gives the right height range and also have the chest belly be reasonable. If you have trouble finding a fit, I’d recommend buying a Helite vest and wearing it over your non-Helite riding gear. We’ve listed the height ranges for each size below. Choose a size that works for your height and also one where your own chest and belly sizes are within a few inchest of the max sizes listed below. For example, I’m 6’ with a 45” chest and a 42” belly, so I’d choose a size XXL. Those with average proportions will choose the size they typically wear in men’s clothing or one size larger. Generally speaking, I find the fit to be about 1/2 smaller than most other riding apparel for a snug fit or even one full size smaller for a more relaxed fit. If you are between sizes in the chart, then choose the larger. Helite is in the business of making air bag riding apparel for motorcyclists. Their “core” product is their vest which is designed to be worn over your existing riding apparel. They also make jackets and vests with the same air bag technology built in. The air bag technology, whether it be the vest or the other riding jackets and vests is basically the same. So first things first… everybody wants to see how the vests and apparel look when they inflate, so take a quick look at the video it inflate! The jackets and leather vest look great and include all the technology in one package. The operation and maintenance of the air bag technology is straightforward so anybody can understand how it all works. And being a mechanically triggered device, it has inherent reliability. All Helite vests and jackets include a CE Level 2 back pad which is often times an upgrade for other brands of gear. Helite gear is well made with robust materials and should last a long time. Helite gear with the integrated air bag technology weighs more than ordinary riding apparel… about 3.5 lbs more. The Airbag technology isn’t cheap and when you buy one of their jackets or vest with the air bag integrated, it can’t be used with other riding gear (for other seasons for example), like the Turtle Vest can. I’m a mechanical engineer by education and I’m also not a youngster anymore, so this Helite air bag technology looks like a great product to me. Anything that ups my chances of walking away from a crash is worth it (check out those medical deductibles these days!). And mentally, technology like this that could easily keep me riding longer. It certainly will also be some comfort to a rider’s friends and family. And surely an easy sell to those with whom you share a budget. Helite makes simple and reliable air bag technology available to the masses! About the Roadster Leather jacket: This is a classic street leather jacket. Its overall fit and cut are somewhere between cruiser style and sport, so it can work with any style of rider. You’ll see some large size stretch panels and also stretch fabric worked in behind and under the arms. Those will help make this jacket more comfortable and make it easier to move and reach for the controls. Those areas also allow room for expansion of the air bag. This jacket is going to work well for mild… maybe warm weather down to cold weather use. 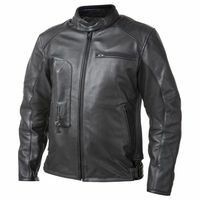 Any solid leather jacket like this works great for mild or colder weather, but can become a cooker in hot summer months. For cold weather, the jacket has a removable full sleeve thermal liner. So with the solid leather shell and the liner installed, it should do great in cold weather. So overall, I’d recommend this jacket for mild to cold weather use. Being leather, I wouldn’t recommend it for wet weather use. Of course to consider this jacket, the overriding factor will be you wanting the air bag technology built in. And if you want that technology hidden away in a sharp leather riding jacket style, this is your jacket!